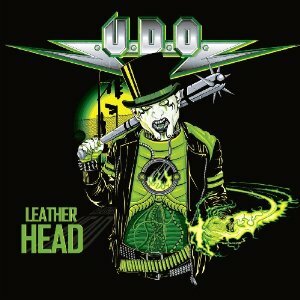 Leatherhead is the first single to be taken from the new U.D.O. album - Rev-Raptor. U.D.O. is of course the band lead by former Accept singer, the hardworking Udo Dirkschneider, who since leaving Accept has continued to make great music. Accept have produced one album in the last 15 years, but in that same time period U.D.O. have released nine (including Rev-Raptor). Leatherhead is perfectly suited to Udo's gravelly voice, and is a great rock song. The fact that the single has been played pretty much constantly since I got it a few days ago gives an idea of how good it is. "Rock 'n' Roll soldiers" is a great rock anthem - a great tune, a good drum beat, powerful guitars, and a catchy chorus for fans to sing along to in the live shows. The video's are worth watching too - "Jingle Balls" is a christmas song as the name suggests, but its actually very good, and as a treat for fans of Accept, "Balls to the wall" features towards the end of the video. Its a cheap-looking animation, but thats fine - its the music that makes it great. One minor issue is one of the videos - the video for "Jingle Balls" is actually called "Evil disposition" if you believe the file names rather than the CD inlay (and the song lyrics do seem to agree that Jingle Balls is the right title). "Leatherhead" and "Rock 'n' Roll soldiers" are both excellent songs (as are the songs that wont appear on the new album) and if the rest of the forthcoming album sounds this good then its going to be one hell of a good album - I for one can't wait to hear it.